What if Jesus meant that we should love our actual neighbours? "The majority of the issues that our community is facing would be eliminated or drastically reduced if we could just figure out a way to become a community of great neighbours." Keeping things simple the church leaders challenged the people in their congregations to take the next small step with their literal neighbours. The movement has spread, and to date over 1,000 churches are practicing the Art of Neighbouring. Here in Coventry Vineyard we want to make a difference in our communities. To take Jesus seriously when he told us to "Love your neighbour". What if he meant our actual neighbours, our next door neighbours, those we live next to or work next to. What would that look like? In the Summer of 2016 one of our Life Groups was inspired to do just this in their local community. Many of us have caught the same vision. So this Summer we are being intentional about building better relationships with our neighbours. and maybe, just maybe our communities and our city will be transformed! 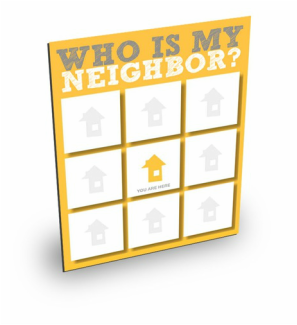 To download the map from 'The Art of neighbouring' website click on the 'Who is my neighbor?' image below. 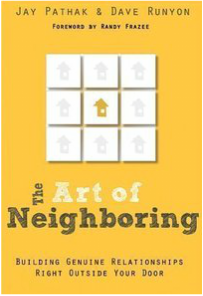 To find out how to use the map, turn to pages 36-40 in The Art of Neighbouring book.